For many years prior to 9/11, two Americans were in unique positions to originate and frame the national conversation about terrorism. Those same two people, Brian Michael Jenkins and L. Paul Bremer, played extraordinary roles related to aviation security and World Trade Center (WTC) security in the few years before the 9/11 attacks. Could Bremer and Jenkins have been front men for a program that hyped the threat of terrorism while at the same time manufacturing terrorist events for political purposes? If so, it would not have been the first time that the American people were subject to the hard sell of a threat to national security only to discover that the threat was overblown or non-existent. The Soviet military threat to the U.S. after World War II is now widely known to have been a fabrication hyped for political and financial gains. The propaganda that drove the Cold War was effective in establishing government policy primarily because it was effective in framing the national conversation about what threats were important to consider, and in controlling the media. The same has been true for the propaganda driving the War on Terror. A short review of the people and reports that promoted the Soviet communist threat is helpful in understanding the “Islamic terrorist” threat that has evolved from it. One man, Paul Nitze, was behind the three most important reports that promoted the perception of a Soviet threat against the United States after World War II. The first of these reports, NSC68, was instrumental in changing the policy of the Truman Administration, which initially did not perceive the Soviets as a major threat. The second Nitze report was the Gaither Report that, in 1957, said the U.S. had fallen behind the Soviets in nuclear weaponry. As an investment banker turned top government policy maker, Nitze was clearly a powerful man. Author Burton Hersh has said that Nitze was one of two people who met quarterly in Frank Wisner’s office to select the missions that would be approved for The Office of Policy Coordination, the CIA’s early covert operations group. Nitze was also the founder of the Committee on the Present Danger (CPD). This was a political action group that brought about the remilitarization of the U.S. in the 1950s by promoting the ideas in NSC68. CPD was resurrected in 1975 and 1976 by Cold War hawks, including Donald Rumsfeld, who wanted to eliminate the policy of détente and Soviet containment in favor of another military build-up. The group was resurrected yet again in 2004 to promote a more aggressive War on Terror. Nitze became the Secretary of the Navy in 1963, serving until 1967, and therefore he was in that position at the time of the 1964 Tonkin Gulf incident. The resulting Gulf of Tonkin Resolution brought the U.S. military into Vietnam based on claims about an attack on U.S. Navy vessels. Government records, produced as early as 1968, indicate that Nitze was responsible for suppressing documents that proved the Tonkin Gulf claims made by the U.S. Navy were false. The U.S. ships were never attacked. Despite these troubling facts, Nitze went on to serve as Deputy Secretary of Defense from 1967 to 1969. His boss, Secretary of Defense Clark Clifford, essentially left the management of the DOD to Nitze. But it was Clifford who authored the official report on the 1967 U.S.S. Liberty attack. Clifford’s report found that the Israeli military was negligent but that the aggression against the Liberty was not pre-meditated. Many of the survivors maintain that it was deliberate. Clifford went on to infamy as a leading figure in the terrorist-financing Bank of Credit and Commerce International (BCCI). In 1969, Nitze and his mentor, Dean Acheson, began to tutor aspiring politicos that had been recommended by their colleague Albert Wohlstetter of the University of Chicago and the RAND Corporation. Under Nitze’s supervision, Richard Perle and Paul Wolfowitz had their introduction to the workings and power structure of the U.S. government. The Tonkin Gulf non-event was undoubtedly an example of false flag manipulation for political purposes and the Liberty incident appears to have been a major cover-up of an attack upon U.S. servicemen. State-sponsored terrorism was already a well-established fact by then, however. For example, the U.S. Joint Chiefs of Staff approved a plan called Operation Northwoods in 1962. Operation Northwoods called “for a wave of violent terrorism to be launched in Washington, D.C., Miami, and elsewhere. People would be framed for bombings they did not commit; planes would be hijacked. [This would provide] the public and international backing they needed to launch their war.” The signed documents are available today and because of this we know that high level U.S. government representatives conspire, on occasion, to commit crimes against the American people for the purpose of starting wars. Although Operations Northwoods was rejected by President Kennedy, the plan becomes more interesting historically when one considers the ensuing activities of the members of the JCS who approved that plan. For example, JCS chaiman Lyman Leminitzer went directly from approving Operation Northwoods in 1962 to become Supreme Allied Commander in Europe (SACEUR), from 1963 to 1969, putting him in charge of NATO forces. According to author Daniele Ganser, the SACEUR ran an agency called the Clandestine Planning Committee (CPC) that was responsible for coordinating Operation Gladio. From NATO and CPC headquarters in Paris, and later Brussels, the U.S. played a leading role in arming and coordinating the terrorist groups in various European countries from 1960 into the late 1980s. Run largely by the US, Britain and Belgium, other NATO countries involved included Germany, France, Italy, Denmark, Norway, The Netherlands, Portugal, Turkey, and Greece. The terrorist attacks of Gladio were coupled with terror propaganda in order to drive public and political will to fund and support ever-increasing military preparation and response to the perceived communist threat. Incidentally, Donald Rumsfeld was the U.S. Ambassador to NATO in 1973 and 1974 and was living and working amidst the Gladio planners in Brussels during the height of that program’s operations. Alexander Haig became SACEUR as Rumsfeld left Brussels, and he remained in that position until 1979. Haig was a White House colleague of Bremer, Jenkins and Rumsfeld before and after his time as SACEUR. Paul Nitze got his chance to oversee the third major report that hyped the Soviet threat thanks to another Operations Northwoods signatory. The project known as Team B was initiated through the actions of President Ford’s Foreign Intelligence Advisory Board, led by Operation Northwoods signatory George Anderson. Team B was a re-evaluation of existing CIA (or Team A) data, by a small group of “outside experts” led by Richard Pipes, that falsely portrayed the Soviet military threat as persistent and growing when all objective evidence said the opposite. The initiative was approved by CIA Director George H.W. Bush, and Nitze and Wolfowitz were among the lead advisors. In 1974 the British part of the Cercle complex worked to create a transatlantic bridgehead of its propaganda front, the Institute for the Study of Conflict (ISC), called the Washington Institute for the Study of Conflict (WISC). In April 1975, WISC was formally founded. ISC, staffed by former MI6 agents, “put over the intelligence community’s views to the press under the guise of a neutral academic research body.” WISC followed suit in the States. WISC joined forces with an existing propaganda machine based in New York, and founded by William Casey and CPD member Frank R. Barnett, called the National Strategy Information Center (NSIC). At the same time, the roles of NItze and the other Team B champions of the military-industrial complex grew under the Ford and Reagan administrations. The last meeting of Cercle Pinay occurred in December 1979, and was attended by William Colby, Federal Reserve Bank chairman Paul Volcker, and Heritage Foundation president Edwin Feulner. The operations of the Cercle complex were redirected by the new head of the French SDECE, Alexandre de Marenches. It was de Marenches who then led the formation of the Safari Club. De Marenches also recommended William Casey as CIA director to Ronald Reagan, and became friends with the Belgian-American propagandist Arnaud de Borchgrave, who was later a shareholder in Stratesec. As with Nitze’s leadership of the three primary reports on the Soviet threat, two men were primary leaders of the terrorism-related commissions in the years leading up to 9/11. These men were Brian Michael Jenkins and L. Paul Bremer. With the help of Nitze and others, Bremer and Jenkins transformed the Soviet threat into a threat of “international terrorism” in the 1970s and 1980s, and further transformed that threat into today’s widely held belief in “Islamic terrorism.” To better understand the roles that Bremer and Jenkins played related to 9/11, and as terror propagandists, we should examine their personal histories. Jenkins played a critical role in planning for future terrorist events at the WTC, including having reviewed the possibility of airliner crashes before they actually happened on 9/11. Coupled with the claims that he participated in planning and implementing a “terror war” in Central America during the 1980s, these facts should make him a subject of considerable examination with respect to 9/11. During this time Jenkins signed on as a field consultant for the RAND Corporation. He became well known for a confidential 1968 paper he wrote for RAND entitled “The Unchangeable War.” Jenkins cited nine obstacles to a U.S. victory in Vietnam and suggested the war could be lost due to these symptoms of the military’s “institutional rigidity.” He also pointed out that his boss, General Cleighton Abrams, was in charge of a pacification program run by Robert Komer, who was credited with managing the mass murder project known as the Phoenix Program and later became a WISC member. In a 1971 paper that described the last ditch effort to “Vietnamize” the war, Jenkins thanked his RAND colleagues Romer and Fred Ikle. As a pioneer in psychological operations, Ikle had written reports and memoranda for RAND through the 1960s. It seems reasonable to wonder if Jenkins was also a psychological operative and if he was part of the Phoenix Program, as is suspected of Richard Armitage. In 1972, at the age of 30, Jenkins launched RAND’s terrorism research program. He was “summoned to Washington by the Nixon administration and asked to help set up a Cabinet-level committee to deal with the terrorism threat.” Two years later, Jenkins wrote that terrorism sometimes works. He also made clear that the ability to engage in terrorism was not limited to foreigners, but that even U.S. soldiers could be seen as terrorists if they killed civilians. Jenkins wrote about “government terror” and how national governments would begin to employ terrorists as surrogates. Jenkins wrote papers with WISC member George K. Tanham and was published not only by RAND but also through Crane Russak Company, which published papers by WISC member James Theberge, NSIC propagandist Frank R. Barnett., and Paul Nitze. A 1976 paper by Jenkins described a RAND summit meeting on terrorism that included such luminaries as Andrew Marshall. In this paper, Jenkins argued for the more flexible military that Rumsfeld later promoted, and he called for the creation of a new kind of special operations unit, just like the Joint Special Operations Command (JSOC) that succeeded the OPC a few years later, to collaborate with the CIA to address terrorism. It was also suggested that U.S. counterterrorism collaboration with the British, West Germans and Israelis should continue. In 1981, Donald Rumsfeld became Chairman of the Board for the RAND Corporation, a role he remained in until 1986 and filled again from 1995 to 1996. As Rumsfeld took over at RAND, Jenkins reviewed media exaggeration of terrorist events and the psychological impact of that coverage. He wrote – “The media exaggerate the strength of the terrorists, creating the illusion of their omnipresence.” At the same time, he reviewed public support, via poll responses, for a “special world police force” to combat terrorism. Around this time, Jenkins began to advocate for using terrorism to psychologically manipulate civilian populations. As an advisor in the construction of a counterinsurgency program in El Salvador, Jenkins recommended that traditional methods be supplemented by the use of propaganda to discredit insurgents as “terrorists.” In another 1984 paper, Jenkins recommended that the U.S. engage in low-intensity warfare against Nicaragua through a proxy army. Such actions fall within Jenkins’ own definition of state sponsored terrorism. By 1986, Jenkins was among a small group that advised Secretary of State George Shultz on matters of terrorism. It was said that “his trips to Washington became more frequent. He also spent time with CIA Director William J. Casey, Defense Secretary Caspar W. Weinberger and other administration advisors.” That same year Bremer became the new Ambassador at Large for Counter-terrorism and Richard Armitage was working as the lead counter-terrorism representative for the Department of Defense. In 1988, it was beginning to become clear that the image of a Soviet threat could no longer be sustained. The Soviet empire was crumbling economically and that fact could not be glossed over. At the time, Jenkins began suggesting that long-proclaimed Soviet responsibility for terrorism was not based on evidence but was politically required in the Reagan era. Jenkins believed that blaming the Soviets going forward could only hurt the anti-terrorism efforts. A new enemy was needed. The problem was that a new enemy of Soviet caliber was not evident at the time. Libya was again blamed for the December 1988 Lockerbie bombing, but the predecessors to al Qaeda, were still working for the CIA in Afghanistan. In fact, Richard Armitage was meeting and working with the Pakistani ISI and the Mujahideen, parts of which would later be known as al Qaeda. Between 1988 and 1998 the U.S. /al Qaeda connection grew, as evidenced by the recruiting done in U.S. centers like al-Kifah in New York, and by the revelations about al Qaeda’s operative Ali Mohamed. Known as a key planner for the first WTC attack in 1993 and a trainer for the 9/11 plot, Mohamed was a U.S. Army drill sergeant and an informant for the FBI. He was allowed to move freely in and out of the U.S. for many years and when detained, he was allowed to plea-bargain. U.S. protection of operatives like Mohamed was one way to ensure an increase in terrorism. But to transform the primary threat from one of a monolithic Soviet or communist empire to a more flexible, non-state terrorist organization like al Qaeda, significant amounts of inter-government communication coupled with public propaganda was required. That is, we needed official commissions to assess and report on the new threat. In 1996, Jenkins was appointed to the “White House Commission on Aviation Safety and Security,” joining Vice President Gore, Stratesec director James Abrahamson, former CIA director John Deutch, and FBI director Louis Freeh. One recommendation of the Commission urged all-civilian implementation of Global Positioning System (GPS) devices provided by the Defense department. Other recommendations focused on the passenger profiling and technology related to hijacking prevention. In 1999 Jenkins co-authored a book entitled Aviation Terrorism and Security with British professor Paul Wilkinson. Wilkinson was a terrorism propagandist for the Cercle Pinay and ISC, the parent organization of WISC. He often made public presentations with ISC leaders, including Brian Crozier, Robert Moss and Hans Josef Horchem, head of the German terror propaganda outlet. As a primary terrorism advisor for Margaret Thatcher, Wilkinson was invited to speak at the Jerusalem Conference on International Terrorism (JCIT) in July 1979, along with Benjamin Netanyahu, Team B members Richard Pipes and George Keegan, Senator Henry (Scoop) Jackson, and George H.W. Bush. “the JCIT established the ideological foundations for the ‘War on Terror.’ The JCIT’s defining theme was that international terrorism constituted an organized political movement whose ultimate origin was the Soviet Union”. Later, in 1999 and 2000, Jenkins served as an advisor to the National Commission on Terrorism, led by L. Paul Bremer, otherwise known as the “Bremer Commission.” Details of that Commission’s findings are related below. Jenkins was also made a primary advisor to the Hart-Rudman Commission, another of the major terrorism related commissions chartered to evaluate the new threat. Members of the Hart-Rudman Commission included Lee Hamilton, who would later become vice-chairman of the 9/11 Commission, and Lynne Cheney, who would quit the commission apparently due to other members not agreeing with her claim that a war with China was the biggest threat to the U.S..
After 9/11, in a 2002 pamphlet called “Countering al Qaeda,” Jenkins wrote – “Al Qaeda constitutes the most serious immediate threat to the security of the United States.” He thanked Bremer. Bremer is most well known for being the Iraq Occupation governor after the 2003 U.S. invasion and for having made many of the decisions that drove Iraqi society into a spiraling downturn. But the man can easily be seen as the most important figure in the U.S. assessment of terrorism prior to 9/11. Oddly enough, Bremer was at the WTC on 9/11. His employer at the time of the attacks, insurance giant Marsh & McLennan, occupied the exact eight floors of the north tower impact zone. In October 2000, Bremer took a job as the CEO of Marsh Political Risk Practice and he had an office in the south tower. Exactly what political risks he was assessing at the time are not known, but he was in precise position to help take advantage of the political win on 9/11. On the day of the attacks, he was interviewed on NBC television and stated that Osama bin Laden was responsible and that possibly Iraq and Iran were involved too, and he called for the most severe military response possible. Google removed the interview video from its servers three times, and blocked it once. Bremer was born in Hartford, Connecticut in 1941, making him just a year older than Jenkins. He was educated at Ivy League prep schools including Phillips Academy a few years before George W. Bush. Like Bush, Bremer also graduated from Yale University, in 1963. He went on to earn a Certificate of Political Studies in 1964 from the Institut D’Etudes Politiques of the University of Paris, and then went on to Harvard for an MBA. In 1966 he joined the Foreign Service, which sent him first to Kabul, Afghanistan, as a general services officer. He was later assigned to Blantyre, Malawi, as economic and commercial officer, from 1968 to 1971. Bremer was in Malawi when it was essentially a police state, and only a few years after Frank Carlucci was assigned to the same general area. Carlucci was urgently expelled from Tanzania by that country’s president after the U.S. was accused of using white mercenaries to attack from neighboring regions. Carlucci was formally referred to as a “Foreign Service” agent, yet was also expelled from both Congo and Zanzibar for subversive activities. During the 1970s, Bremer held various domestic posts with the State Department, including as an assistant to Henry Kissinger from 1972 to 1976. He was Deputy Chief of Mission in Oslo from 1976-79, during the time that Alexander Haig was SACEUR. In 1981 Bremer was made Executive Secretary and Special Assistant to Alexander Haig. Shortly after Haig’s resignation in June 1982, senior officials in the State Department were told by Bremer, who “runs the nuts-and-bolts operations of the department,” to prepare brief memos on key issues to bring Mr. Shultz up to date. As Schultz settled in as the new Secretary of State, he specifically chose to retain Bremer and Lawrence Eagleburger among his top aides. Ronald Reagan appointed Bremer as Ambassador to the Netherlands in 1983 and Bremer stayed in that position until 1986. The secret wars of Gladio proceeded in The Netherlands while Bremer was there, as they had in Norway when he was Deputy Chief of Mission in that country. In 1986, Reagan brought Bremer back to the U.S. by appointing him Ambassador-at-Large for Counterterrorism as well as Coordinator for Counterterrorism. William Casey and the others in the Reagan administration had been meeting with Brian Jenkins that year on the terrorist threat. At the time, Libya’s leader Muammar Qaddafi was cited the greatest purveyor of terrorism. This might have had something to do with Qaddafi’s attempts to convert his oil trade from U.S. dollars to a new African gold dinar. But the bombing of a Berlin discotheque was blamed on Libya and the U.S. bombed the country in response. While Bremer was the Ambassador to the Netherlands and then the State Department’s counterterrorism lead, Paul Nitze was Special Advisor to the President and Secretary of State on Arms Control. Nitze went on to serve in a similar role for George H.W. Bush, but Bremer resigned to join Kissinger Associates as Managing Director. As Bremer resigned, the New York Times reported that Reagan’s Clint Eastwood-style talk about fighting terrorism had come to little or nothing in terms of justice. During Bremer’s tenure only one terrorist was ever brought to the U.S. for trial, and he was small potatoes. Abu Nidal was cited as the “most notorious practitioner of terror in the Middle East” yet no indictment for Nidal was issued. Kissinger Associates had a number of meetings with BCCI representatives, perhaps while Bremer worked there. BCCI was involved in funding terrorists and was linked to the Pakistani intelligence network, from which several alleged 9/11 conspirators came, including Khalid Sheik Mohammed. In fact, Time magazine reported that — “You can’t draw a line separating the bank’s black operatives and Pakistan’s intelligence services.” As the BCCI scandal came to a crescendo, Bremer and his colleagues at Kissinger Associates refused to provide documents requested by the Senate investigators. At the time of the February 1993 WTC bombing, Bremer made a remark similar to that Jenkins made, in terms of the difficulty in preventing terrorism at the WTC. Again, it seems odd that the American who knew the most about terrorism would remark about the danger to the WTC and then be located in exactly that dangerous spot on 9/11. It is also curious that his colleague Jenkins, who was perhaps the second most well-known U.S. terrorism expert and who designed the security system for the WTC complex, would make a similar statement about the inability to protect the WTC. In 1996, while still working for Kissinger Associates, Bremer wrote a scathing article about Clinton’s lack of focus on terrorism. In this article, Bremer called on Clinton to enforce a strong, ten step plan to address terrorism through uncompromising action. “These are not options” he wrote. Apparently Bremer did not see the irony in his comment about options with respect to his own company’s refusal to cooperate with the Senate investigation into the terrorist financing BCCI. In 1996, the Khobar Towers in Saudi Arabia, located near the headquarters of Saudi Aramco, were bombed. Contrary to claims that al Qaeda was behind the bombing, the U.S. blamed Hezbollah al-Hejaz for the attack. The U.S. government had attributed only four terrorist attacks to al Qaeda prior to 9/11, cited in a 2002 State Department list and re-published in 2004. Those attacks were a series of bombings in Yemen in December 1992, the shooting down of U.S. helicopters in Somalia in 1993, the bombings of U.S. embassies in Africa in 1998, and the U.S.S. Coleincident in 2000. In August 1998, two U.S. embassies in Africa were bombed and the attacks were attributed to Osama bin Laden (OBL) and the as-yet unreported group called al Qaeda. The US government responded with bombings of Sudan and Afghanistan and, with help from the New York Times, began to drum up an intense myth about OBL and al Qaeda. In retrospect, it is surprising that this was the first ever reference to al Qaeda in the New York Times, only three years before 9/11. The first New York Times reference to “Ussama bin Laden” was In April 1994. However, the first media reference to “al Qaida” was six months after the CIA’s Alec Station started, in August 1996 by UPI. Alec Station, which focused on the pursuit of OBL, began operations in February 1996. But the 9/11 Commission suggested that the CIA had knowledge about al Qaeda four or five years before that. It is not clear why the New York Times did not pick up on al Qaeda as a threat until just a few years before 9/11, and ten years after the CIA had. More surprising is that The Washington Post did not report on al Qaeda until June 1999, and the reporting was highly speculative about the power behind this new threat. “The indictment describes bin Laden as the leader, or “emir,” of al Qaeda, a “global terrorist organization” with tentacles that allegedly reach from his hideout in the mountains of Afghanistan to followers in Texas, Florida and New York. These statements should be compared to those of Bremer made a year earlier. Bremer was completely confident where the Post was skeptical. In any case, Bremer was selected for a leading role in several of the ensuing terrorism commissions. First, he was appointed to the Gilmore Commission, chaired by Virginia Governor James Gilmore. Donald Rumsfeld was originally a member of the Gilmore Commission as well. The vice chairman was James R. Clapper, the current director of national intelligence. Coincidentally, James Abrahamson, director of WTC security company Stratesec, later hired Clapper as his fellow director at the satellite spy company Geo-Eye. Unfortunately, despite the Commission’s 1999 claim that “All terrorist acts are crimes” the greatest terrorist attack on American soil would happen two years later and would not be treated as a crime. This could be because the Gilmore Commission excluded “acts of violence committed by bona fide state agents” and therefore we were all free to assume what the 9/11 Commission eventually concluded – that no government supported the 9/11 conspirators. The Gilmore Commission found no evidence of U.S. sponsored terrorism or state manipulation of policy through violence despite the 1990 revelations of Operation Gladio, the 1997 revelations about Operations Northwoods, and the Tonkin Gulf non-event, which was widely known to be false as of the mid-1990s. 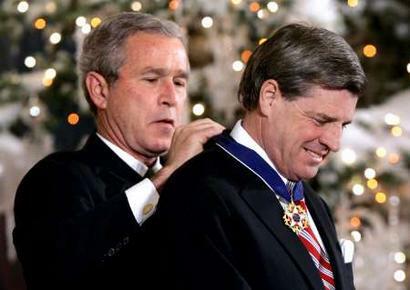 Bremer was then appointed Chairman of the National Commission on Terrorism by House Speaker Dennis Hastert in 1999. Other members of the Commission included Jenkins, Fred Ikle, James Woolsey, Maurice Sonnenberg, and Jane Harman. In July 1999, the sole Muslim nominee for Bremer’s commission was removed after complaints from certain political action groups. Apparently, the practical outcome of equating Islam with terrorism was already a foregone conclusion. The “Bremer Commission” based its report on interviews with a number of people who were seen as experts on terrorism. This included Richard Armitage. Marion Bowman, Richard Clarke, Stephen Cambone, FBI director Louis Freeh, Robert Gates, Jenkins’ RAND cohort Bruce Hoffman, Lewis (Scooter) Libby, soon-to-be acting FBI director Thomas Pickard, Michael Rolince, Michael Sheehan, CIA director George Tenet, and Jenkins’ fellow propagandist and JCIT attendee, Paul Wilkinson. To clarify how oddly coincidental this interview list was, one should remember that the number of U.S. intelligence failures to capture the alleged 9/11 hijackers was astounding. And many of the people mentioned above, including Richard Clarke, George Tenet, Louis Freeh, Marion “Spike” Bowman, Michael Rolince and Thomas Pickard played critical roles in those astounding failures. Others on the list, like Armitage, Casey protégé Gates, Rumsfeld sidekick Cambone, and Cheney assistant Libby, benefited from the 9/11 attacks through unprecedented political gain. Wilkinson’s presence is simply evidence that the Bremer Commission was a propaganda operation from the start. Surprisingly, according to the Commission’s vice chairman Maurice Sonnenberg, the Bremer Commission essentially wrote the USA Patriot Act. Sonnenberg boasted that 20 of the Commission’s 25 recommendations made it into that controversial and poorly reviewed legislation. Sonneberg’s company, Bear Stearns, went on to be at the center of the 2008 financial meltdown, requiring tens of billions in bailout money, and is currently facing a number of securities and investment fraud charges. These irregularities point to what could be called financial terrorism, as well as the fact that, occasionally, the “top dog’s” formal aristocracy needs to be bailed out by the little people. The Bremer Commission recommendations included a plan to transfer power to the Department of Defense “during a catastrophic terrorist attack or prior to an imminent attack.” Another recommendation was to prepare a manual on how to implement legal authority at the federal, state and local levels in case of a catastrophic terrorist attack. Yet another was to institute annual exercises under the direction of the national coordinator for terrorism (Richard Clarke) for counterterrorism and consequence management during such an event. As the Bremer Commission report was being issued, Bremer appeared on PBS’ Frontline television program to discuss the report’s claim that international terrorism was an increasingly lethal threat to the United States. Joining Bremer was Larry Johnson, a former CIA covert operative and State Department expert on terrorism. Only two months before 9/11, Johnson was even clearer. Of course, the 9/11 Commission came to the opposite conclusions. And Johnson now works with Barry McDaniel, the former COO of Stratesec. Just days after the 9/11 attacks Bremer was chosen to co-chair the Heritage Foundation’s Homeland Security Task Force, which created a blueprint for the White House’s Department of Homeland Security. On this task force was Edwin Meese and, again, Fred Ikle. The report called for considerable increases in military spending that were not related to terrorism, including much of which Cheney and Rumsfeld had desired before 9/11. Bremer also started a new division of Marsh & McLennan, which went on to purchase Kroll Associates as well, called Marsh Crisis. At the same time, a company called Control Risks merged with Bremer’s Marsh Crisis. Based out of London, Control Risks had been one of the most prominent “terrorism research” outlets supported by Cercle Pinay and its propaganda branch, the ISC. In 2003, Bremer was selected by Donald Rumsfeld to become the Administrator of the Coalition Provisional Authority of Iraq (the Iraq Occupation Governor). His “mistakes” there were monumental. Bremer’s closest aides during his tenure in Iraq included Clayton McManaway, previously an operative within Robert Komer’s Phoenix Program. Bernard Kerik, who was New York City Police Commissioner on 9/11, was appointed by George W. Bush to be Minister of the Interior for Iraq and Senior Policy Advisor to Bremer. Assigned to train the new Iraqi police, Kerik’s work in Iraq was widely recognized as a dismal failure. By the time his remarkably short assignment was over, he had offended the US. military and left the newly forming Iraqi police force in shambles. Bremer was not without his small successes, however. At the time of the wildly sensationalized capture of Saddam Hussein from a “spider hole,” Bremer proclaimed — “Ladies and gentlemen… we got him!” Of course, the man Bremer had previously told us was behind the deadly terrorist network called al Qaeda, and the crimes of 9/11, was never captured. Instead, OBL was killed by the JSOC which quickly dumped his remains in the sea seven and a half years later. Bremer and Jenkins have gone on to lend their voices in support of the never-ending War on Terror. In fact, Jenkins’ assessment today is that — “We are not going to end terrorism, not in any future I see.” However, considering what we know about these men, their strong links to terror propagandists, and their extraordinary roles with respect to 9/11, it seems an end to terrorism might begin simply through a more close examination of L. Paul Bremer and Brian Michael Jenkins. Sourcewatch page for Bear, stearns & Co, http://www.sourcewatch.org/index.php?title=Bear,_Stearns_%26_Co.,_Inc. Sourcewatch, Crisis Consulting Practice of Marsh, Inc.,http://www.sourcewatch.org/index.php?title=Crisis_Consulting_Practice_of_Marsh,_Inc.